Art history goes beyond aesthetic judgment (“this picture is pretty”) and, when done right, it also goes beyond mere interpretation (“this is what this picture means”). It reaches for a kind of sympathy with the activity of art making (“this is how this picture means”). Michael Baxandall, in language that was clear, graceful and extremely scrupulous, was able to do this sort of art history better than anyone else. I heard about his death yesterday (he was 74, and a professor emeritus at Berkeley), and I wanted to set out a few thoughts about what he's meant to me professionally. I don’t think I’ll have enough space to give a full account of his contributions (the obituary in the Telegraph does a fair job of that), but I’ll try to give at least a sense of his method. This paragraph is by now legendary. No one in art history had ever written like this before: this peculiar combination of lucidity and plain-spokenness, this refusal to take any aspect of the historian’s activity for granted. When you think about it, the statement itself is obvious. But it is obvious like Mozart is obvious: not a single gesture wasted, and it's a lot harder than it looks. “Painting and Experience” is a good place for non-professionals to start with Baxandall’s work. It is under two-hundred pages, and discusses famous artists. He was no “public intellectual,” and I can’t provide a link to a single essay of his online. Everything he wrote, he wrote as a specialist, for specialist journals or through university presses. But, because of his style, it is all accessible to interested amateurs. 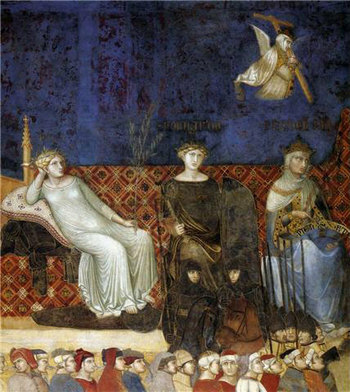 In “Painting and Experience,” he talks about the “period eye”: how elementary math, dance manuals and humble crafts like that of the cooper and the gauger, were part of the mental and visual environment of artists like Masaccio, Piero della Francesca and Filippo Lippi. Baxandall cared as much for this kind of street-level knowledge as he did for the refined tastes of art patrons. But he was no doctrinaire Marxist (unlike some of his latter-day disciples, who used his work as an excuse to discount connoisseurship). A great deal of his effort went into accounting in as precise a way as possible for the physical and tactile qualities of the works he was assessing. 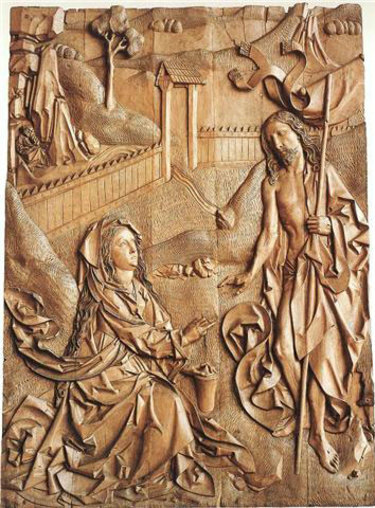 My favorite of his works is “The Limewood Sculptors of Renaissance Germany.” German wood sculpture of the fifteenth-century doesn’t share the prestige of Italian painting from the same period. When you read this book, you’ll wonder why that should be so, or why a name like Riemenschneider (see image at top of post) isn’t as available to public adulation as Raphael’s is. For years now, whenever I've needed to be reminded about what is possible in writing about art, this is the book I’ve sought out. One of my favorite passages in it is about the relationship between the smaller aspect of a form and the larger: how a motif becomes a metaphor. 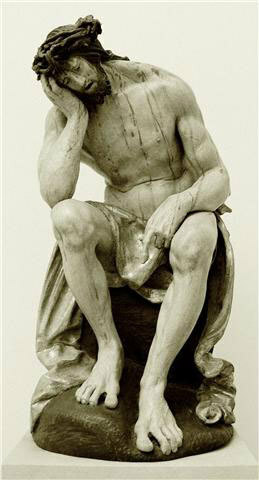 In the passage, Baxandall is discussing how we can understand a sculpture by Hans Leinberger (which shows Christ in distress) by looking at Paracelsus’ theory of Signs. It’s on page 160-163, and you can sneak a peek at it in google books. What he’s attempting to do in “Limewood Sculptors” is to map one set of terms (the English language) onto another (German carving of a specific period), and to do so without jumping to unwarranted conclusions. So the book is full of assertions that are immediately qualified, qualifications that right away strengthen the usefulness of the assertions. The book is positively astonishing (as most of his work is) if you’re familiar with the theory-crippled, poorly thought-out dreck that often passes for academic writing. “There are many different definitions of ‘work of art,’ but most refer to a class of physical objects and the mental states associated with them. There are various definitions of ‘society’ too, but most come down to describing it as the complex of institutions through which an individual finds a relation to a collective. These are not so much different things as systematically different registers about things, partly the same things. The relation of a work of art to a society is not the relation of part to whole—like the relation of apple to apple tree. It is not the relation of two analogous systems, like the relation of flower to tree. It is much more like the relation of, say, a chemical entity like carbon to the tree. Clearly carbon is deeply involved in a tree, as part of the input, part of the fabric, and so on. Similarly a tree acts with and on carbon. But each term takes its meaning from belonging to a different set of categorizations of systems—one being chemical, the other being biological and botanical. Carbon takes its meaning out of a difference from and relation to other chemical concepts—hydrogen and oxygen and so on. ‘Tree’ is one of a set of classes of a biological system. Now obviously if one discusses Art and Society—or Tree and Carbon—in general terms one can cope better with this kind of conceptual awkwardness, without falling into type or category confusions. What I am saying is that when we are dealing with the relation of complex particulars—a picture and a society—the underlying conceptual awkwardness is liable to lead one into the kinds of problems I listed five of just now. In short, ‘art’ and ‘society’ are unhomologous systematic constructions put upon interpenetrating subject matters. So what do we do? We follow what I shall call the Bouguer principle. Pierre Bouguer, after whom I call it, was the eighteenth-century scientist who first developed a reasonable means of measuring light, and he seems to me a paladin of the art of relating to each other things difficult to relate. His problem was that, before the development of photoelectric or other physical means of measuring light, everything had to be done by eye and mind—like art history. And, given two unequal lights, say two differently sized candles, the mind could not come to a precise conclusion about the quantitative relation of one to the other: it could not say, ‘candle A is 27 percent stronger than candle B.’ Bouguer’s elegantly simple solution was to observe that, while the mind could not do that, it could decide very precisely just when two lights match each other. So he took one candle, moved it closer or further away until it matched the other, measured the differences between the distances from the eye of the two now matching candles, and from this difference worked out (with the law of inverse squares—though that is no part of the analogy) the relative strengths. So, very generally speaking, the Bouguer principle is: in the event of difficulty in establishing a relation between two terms, modify one of the terms till it matches the other, but keeping note of what modification has been necessary, since this is a necessary part of one’s information. This is trademark Baxandall: the patient, inductive tone, the crystalline language, the erudite undertow, all in the service of clarifying our words for images. I’m sorry never to have met him in person, but I’m grateful to have his books on my shelves. I forget sometimes that academic writing can be this good! I've been away from it a long time. Thanks, Teju. Requiescat in pacem. Teju's recommendations seem to take me in new directions. I've listened to Anner Bylsma's version of Bach's cello suites over fifteen times (according to my iPod) because of Teju's reflections on them in his late blog. I look forward to reading some Baxandall now. Getting across "how a picture means" sounds like something I'd like to learn more about if only to write better about pictures, mental or otherwise. You once wrote an excellent post about the pleasure of reading slowly; I often think of it - thanks for making an appearance on the internet again. Thanks so much for publishing this, Beth. And Teju, it's a privilege to share your love for a mentor. I was moved to look in the library of the university where I worked, and found a copy of 'Painting and Society in Fifteenth Century Italy'. I read the first few pages in my lunch hour, and I think it will live up to your recommendation. Crystalline language indeed. And full of incredibly interesting information that will make me see so much more in the paintings and engravings. I'm really looking forward to reading the rest of the book, and then taking it with me to look at some of the works he mentions, which are in the National Gallery here in London. I'm suffering from all the old irritations of sloth: it's LINDEN they're carving, or better yet, and even closer to home BASSWOOD! I just get so mad for being given the impression that I have to tramp all the way to Europe to find something that grows in my own backyard. Yes, limewood has a beautiful etymology -- but still! It's basswood that gets carved 'round here. Nothing of which has anything to do with your fine essay and its subject. Thank you for bringing it here. It's a joy to get this sign of your life. Thank you for publishing this, Beth, and for writing it, Teju! I haven't the time to comment in detail but just want to say this is wonderful writing and an introduction to an art historian that I'd never heard of before, in spite of years of study in art school. Must find these books! A very interesting essay. I have always been fond of writing but as I delve further into the academics of writing I find that I have a challenge ahead of me, one that I meet willingly. I intend to research/read several of the items listed in this essay.